The Importance of Self-Confidence People will judge our COMPETENCE by the CONFIDENCE that we show. For example, let's say that you are going in for surgery, and just before you go under, the surgeon walks into your room. His posture is slouching, as he speaks, he stumbles over his words somewhat, and when you look at his hands, they are trembling a little. Now, it doesn't matter how good of a surgeon he is, you'll probably want a second opinion (maybe even a third opinion) -- Fast! Well, it's the same in just about any industry. People judge how good we are at what we do by how confident we are when we communicate with them. If we speak with poise and confidence, they will automatically make the assumption that we are competent at what we do until we prove ourselves otherwise. The opposite is true as well. When we speak with nervousness or fear, the audience will automatically assume that we don't know what we are doing until we prove ourselves otherwise. What Ways to We Assess Someone's Competence? Think about any situation where you've had to hire someone to do work for you that where a significant investment was necessary. How did you judge whether the person was competent? There is a good chance that you you likely conducted interviews of some kind. You probably also listened to not only what the person said, but also how he or she said it. I'll give you an example. My wife wanted to remodel our kitchen. She called about a dozen contractors and conducted phone interviews with them. A few of them never called her back, so the list got shorter pretty quickly. Of the ones who did call her back, she had a series of questions that she had each of them answer. A few of the contractors were vague or confusing in their answers. They were also eliminated. She ended up with two candidates. The first one had us come to his office which was only a couple miles from our house (very convenient). He was very friendly and invited us into his huge office that had a movie screen hidden behind a wall. He touched a button, and the wall opened up. He began showing us a video of a rendering of our remodeled kitchen that was exactly what my wife wanted. He had listened to the questions that she had asked him in that first interview, and he interpolated what she actually wanted in the kitchen. It was a brilliant sales pitch. Then he showed us the price. I think that I threw up a little in the back of my throat when I saw the number. It was HUGE. The second guy came to our house with a photo-album. He asked us questions while he was sitting in our kitchen. We told him the ideas that we had, and he flipped through his album each time showing us something similar that he had done in another house. The whole time, he was telling us the stories about these examples, and what he learned from each. He also wove in a few examples where things didn't go so well, and how he learned from those projects as well. His estimate was also about half of the estimate of the other contractor. So we hired him. Don't Miss the Point. We Didn't Choose the Contractor Based on Price. I often tell this story in my presentation classes, and I ask the audience, "What did my wife and I make our buying decision on?" Most of the time, the answer is "price." Seems obvious, though. The guy that we chose was half the price of the one that we didn't choose. But if you have that perception, you are forgetting about the other 10 contractors. In fact, if the lower priced contractor had not been able to prove to us that he was competent, we would have chosen the high priced contractor. In reality, though, the guy we chose did the best job at mitigating our risk that the job wouldn't be done properly. My impression of the first guy was that he was probably good at his job. We could tell that he was very successful. But when he showed me his price, my perception shifted, right or wrong, into thinking that his price was high so that he could pay for his electronic toys. A couple of days ago, I took my kids to a fast-food place. It was pretty busy, so I jumped in the shortest line. When I got to the front of the line, I gave the young person my order, and I could tell by the look in his eyes that something I had said had confused him. He looked down at his screen and started searching for the item that I had mentioned. My first impression of him kicked in, and it was "This person doesn't seem very sharp. I may have made a mistake getting in this line". I watched his finger searching the electronic menu, I could see it tremble a little. All of the sudden, I had a better understanding of the situation. My perception changed from "This person isn't that sharp," to "Ahhh, he must be a trainee". Immediately after drawing that conclusion, I glanced at his name name-tag, and there it was... Trainee in small letters under his name. (By the way, he gave us great service and did a great job, but that is not the point.) The point is that his self-consciousness caused him to question himself. When he questioned himself, he showed nervousness. The nervousness came across to me as him not being that good at working the cash register, yet. Every time that we interact with others in the business world we create an impression on those people. I think back to challenges that I have had in public speaking as well as the successes that I have experienced. The difference between the two always comes down to one, single thing -- how I felt about myself at the time. For instance, when I was an intern giving a report about my summer to a bunch of corporate vice presidents, I felt inferior to everyone in the room. I failed miserably. The very next year, though, I received an award from my industry association for being student of the year. There were thousands of people in the audience, but I nailed the speech. I remember thinking that I had done something that very few (if any) of the people in the audience had ever done. I was the expert at that moment. That realization was freeing. You often see name-tags with "Trainee" in hourly positions. Do you know where you never, ever see a trainee name-tag? 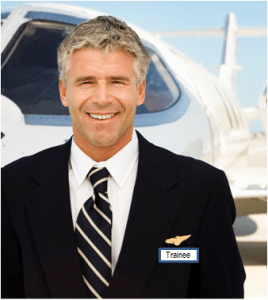 You never see an airline pilot with the word "Trainee" on his name-tag. However, pilots speak to the entire plane at least twice on every flight. Just as the plane reaches the cruising altitude, the pilot will make an announcement. The pilot will make an announcement again as the plane begins to land. Now, I'm not a pilot, and I've never applied to be a pilot. However, I will bet a substantial amount of money that pilots have actually lot their jobs because they couldn't build confidence with the passengers when they make those announcements. When someone is flying on a commercial airline, that person wants to be confident that the person flying the plane is competent. It seems like a minor point, but when the pilot makes the announcements, if he or she sounds nervous, the entire plane will freak out. So what makes this person so much more trustworthy? Well, it's the training. The training that a pilot goes through is extensive. Do you want to give the perception to people that you are a Trainee or that you are the Professional? To be the professional, you want to exude self-confidence when you present to groups, speak to individuals in a one-on-one fashion, and when you lead people. That way, the outside appearance matches the inside competence. The good news is that, most often, when we are asked to speak in to a group in a business setting, it is because we know more about the topic than anyone else in the room. (Otherwise, someone else would be speaking on the topic.) If you understand this, it will help you carry yourself in a more confident way. You have the cookie. You have the information that the people in the audience want and need. And you are the best person to deliver that information. Most of presenting is a mental game. Yes, we have to create compelling speeches. Yes, we have to be interesting and entertaining. However, most of the time, your audience will create a quick impression of your competence based on how self-confident that you appear in your delivery of that information. Just like a pilot, the best way to create this perception of expertise is through training and practice. To overcome public speaking fear, break the skill into component parts and master each part. Fearless Presentations® helps each presenter have a series of public speaking successes by changing the way that we PREPARE for a presentation. Our step-by-step process makes writing and delivering presentations much easier. Once you have a series of success after success after success with zero failures in between, the fear of public speaking fades away, just like the fear of driving on the freeway faded after a few successes.